I suspect both Merc. and Ferrari have already decided to designate No.1 and No. 2 drivers in view of the way Kimi let Seb by easily, and Bottas did the same for Lewis twice during the race. It seems likely Ferrari realised their mistake (not letting the faster driver by) in China, and Merc. realised during this race. Having said this, with a bit of luck I'm wrong - and both teams will only use team orders when one driver is clearly slower than the other. Not that I would disagree with the basic idea of No.1 and No.2 drivers, just that in this race Kimi's driving and his objectives were completely irrelevant to Vettel's racing for the win (which he accomplished, after all). It would be rather an act of a "crime" if Kimi was to attempt to obstruct his teammate from winning the race just for the sake of it when he himself never had neither a pace nor a racing craft to contemplate a podium even. You don't think that Kimi is the #2 driver with the strange strategies he is given, every race it seems he is in an argument over his strategy. Bottas had poor race pace in all stints and not just the start. I didn't see anything in the race which tells me Bottas would have pulled away in the first stint. What's the reasons for the rest of the race? Bottas couldn't pull away from Hamilton on faster tyres. I agree that he may well not have done that well later on in the race but the team was saying that there was a problem with the trye pressures as well as uneven brake temperatures in the 1st stint. I don't see how you think he won't have been able to do at leased a little better in the 1st stint if it wasn't for these issues. Then on the podium and after the race, Bottas did say that on the 2nd and 3rd stint, he had oversteer and the car didn't feel quite right. But as some others have said, his car could well have been set up to be good in qualifying and this may explain why his race performance was worse. Hopefully he'll do much better next race. He's always been really strong in both qualifying and the race in Russia. I remember Hamilton praising him in the podium room for his fantastic pace in the race in 2014. I think the team should allow them to race there. To me, it spoils the race quite a bit when a driver has to make it easy for their team mate to pass. At leased Bottas was willing to do so this race. There were too many occasions last year where Hamilton failed to obey team orders. Whilst I agree with the that is probably the case, as I previously mentioned I also think that 'the leading car pits first' policy needs sorting. It assumes that the leading car is the fastest driver. Where this is not the case it removes the possibility of the undercut, (for Hamilton in yesterdays race). In a season when overtaking is tricky maintaining the status quo removes that method of passing other drivers. MV was quick witted enough to spot it IMV it should be an option for the driver wherever he is on the track. Its funny how attitudes have changed recently as favouring/issuing team orders used to be considered as proof of No. 1 status -unless the other driver was mathematically out of the equation ! I think what the problem is in this situation is that Vettel has no competition from his teammate. It would be VERY interesting to find out the reasons behind why both Lewis and Bottas looked unhappy on the podium. I think it will be to do with when they got pitted. But I certainly think that Mercedes forcing Bottas to allow Hamilton through cost him 2nd place. Bottas seemed to manage to keep drivers behind even when he had a tyre pressure issue so I'm pretty sure he'll have managed to keep Hamilton behind if he hadn't been forced to let him by both them times. I think that must be what Bottas is annoyed about. I just wish there were not these orders. I think the objective for Mercedes was to win the race and not to keep Bottas happy? Mercedes race for wins and not second places. Bottas had no chance of the win and even though Mercedes left it too late there was still a slim chance of the win. This just reads like if Bottas could have driven faster than he could have won the race, do you think that Mercedes have a chance of the WDC with Bottas? Why didn't Mercedes order lewis to give back the position to bottas once it became obvious he couldn't win? Don't get me wrong, i think it was the correct move at the time but it's it's almost an unwritten rule, you move aside for your teammate and if he doesn't achieve the goal that you moved aside for, you get your position back at the end. I am sure i even heard lewis say he would on team radio at the time. I nearly thought I overheard this, as there was noise around when I watched the race. But it's truth. Bottas' faith in Mercedes could be crushed and his facial expression on podium well explained by this event. Yes, suppose you are right there. But it just seems that too many people rate him lower because of his score. If Mercedes continue to force him to allow Hamilton to overtake all the time, then his points really will make him look worse than he actually is. Even though it will be very unlikely, I still wouldn't say Mercedes have no chance of getting the WDC with Bottas. We don't yet know how much he may improve. It has only been 3 races with a totally new team. A couple of things; the pace difference between them suggests that Hamilton could have overtaken Bottas but the team did not want him to lose too much time behind him. So moving him out of the way was expedient. Secondly, it would be extremely foolish for Mercedes to throw away the WDC just to placate Bottas's ego. If he wants to challenge for the championship, he will need to perform better. It's as simple as that. Mercedes do not have a margin over their competition so they cannot allow Bottas to hold up Hamilton in hopes of a fluke win. What's more likely is that it would have taken Hamilton several laps to make a pass and by the time he did, Vettel would be 12 seconds up the road. That would be an extremely foolish thing for Mercedes to sit there and watch. Mercedes cannot allow Bottas to serve as rear gunner for Vettel. I hope you can understand that. The fact that Hamilton's DRS failed in his final Q3 lap only adds more context to the weekend as it explains why Bottas was on pole in the first place. Anyway, it will be a lesson learned for the team. Ok, I do understand why the team will do this in the race. But saying that this DRS thing in qualifying explains why Bottas was faster in qualifying... How can Hamilton not have known this at the time. He said Bottas simply did a better job. So there is no point taking it any further. He there was something worn, surely he would have noticed it? If you pay attention that's basically what Lewis usually does. He's generally not one for making excuses. The DRS failure explains why he lost so much time in the sectors with DRS zones on his final Q3 lap. Most of us just assumed he made a mistake but apparently that is not the case. Would love to get the onboard footage to confirm though. After he was jumped at the start and couldnt get the place back - in the laps coming up to the first pit stops, Mercedes should have told Hamilton to mirror whatever Vettel did. He could have followed him into the pits. A bit of quick thinking and alertness needed, but it would have at least kept him in touch and he'd have been on the seemingly preferred tyre for their car. If it got to the point Bottas was due to pit, then Hamilton would have had to stay out that lap regardless of what Vettel did. Obviously in the real world, the SC would have affected that strategy, but they didn't know that at the time. It might have worked, it might have not. But the refusal to alter their plan mid-race could cost Merc this year - they really need to get better with strategy. Yes indeed but it now appears that Hamilton asked for something that Mercedes were prepared to do in the first place, if you believe them, also if Hamilton had done this then Mercedes would have been looked upon as laughing stocks with no ambitions of the WDC title. If it was a problem with his car that actually affected his lap, I somehow don't think he'll have been as happy for Bottas as he was. If anything does affect him in qualifying, I've found that he usually does mention it. Given the way he congratulated Bottas, I think he was actually thinking that Bottas had done the better job this time. In the interview with the top 3 drivers, Hamilton said that he was over all, he was a little bit down on Bottas. Why would he admit to this if it wasn't true and he had an issue that was responsible for the time loss? In this day and age, I'm sure we'll get concrete confirmation one way or the other pretty soon. Yes, I should stop arguing and wait to see if anything gets confirmed. I may well be wrong as hardly anyone seems to think the same as me. 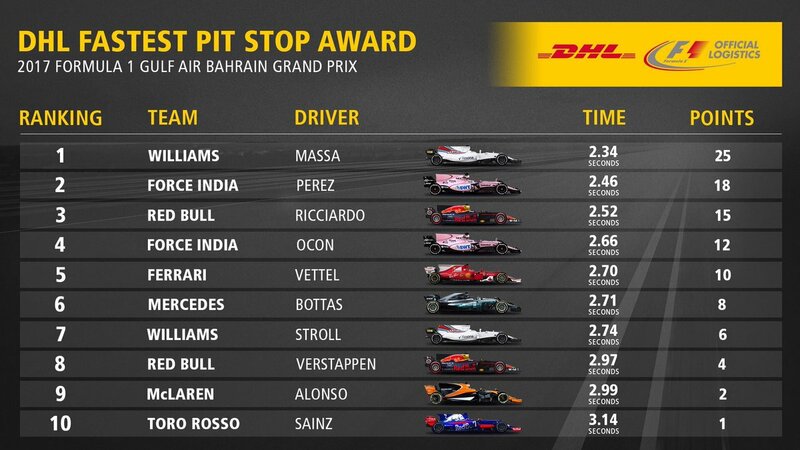 Nice to see Williams at the top still! Hamilton was much faster than Bottas and would have overtaken him anyway. Bottas was ordered to move aside to minimise the time lost to Lewis, which is the sensible thing to do. If Bottas doesn't want it to happen again, he needs to be faster. TheGiantHogweed I wonder, would Mercedes top the same chart for the slowest pit stop award? In the last 2 races I would guess they took that, both with Bottas. Both Lewis and Bottas looked extremely unhappy after the race/on the podium. Presumably they're both blaming the team - although probably for different reasons? Hamilton has no one to blame but himself. A scruffy start under pressure yet again, something he was guilty of a lot last season. The pit lane blunder while under more pressure. Hamilton is not dependable when the heat is on, he makes a lot of mistakes. Seb by contrast is ice cool and just smoothly gets the job done. We are only three races into the season and if Hamilton's engine goes bang at the next race everything will look different again. Mercedes will not give up on Val for many races yet. It is far too soon, and Toto will want to give his racer every opportunity to realise his full potential. Ham is cracking when the heat is on. He doesn't have the temperament to win the WDC unless he's against weaker opposition or the luck goes his way. There are many drivers on the grid as good as Ham but he looks better than he is because of the car he's in. Vettel is outclassing him at the moment and making him look foolish. Thoughts? A bit harsh though, but not far from the truth! Yep I've made that point many times about Hamilton and him making silly mistakes when the pressure is really on him. The pit lane incident yesterday was unbelievably stupid for such an experienced driver. As Dani Ric said, Hamilton should have been more clever and tried to do something before they gained entry to the pit lane. I agree Seb is doing an incredible job atm and really piling on the pressure. Both Hamilton and his team have not responded well to it so far, but there is a long way to go. Thing is, Bottas seems a fairly useful qualifier. If Merc adopt a different strat they can tag-team Vettel. Kimi needs to improve and get stuck in. Has someone hijacked your account or something? It appears that some posters here already know me too well. Might be 1 or possibly 2 but many?? There is surely little doubt that he is in the top 3 probably the fastest. Take away the strategy, safety car, penalty etc from the teams yesterday he would have won by a margin and Ferrari are supposed to be close to parity. I believe Hamilton was the fastest man on track, yes. I think Mercedes had the better race car than Ferrari but a mixture of team incompetence and Hamilton losing a place off the start and suffering a self inflicted penalty cost them a win that I would suggest had a greater than 50% chance of occurring. In short, Mercedes collectively must improve. Vettel and Ferrari are acing it. It's 3 races into the season. I'd say that, between Hamilton and Vettel there is no way to give much of an advantage to either in Australia or in China. In Bahrain I would say Vettel did the better job but again it's all small margins here. There is no advantage on race day to either car and thus far there has been a massive advantage to Vetel when it comes to the pit wall. Ferrari have made much better strategic calls and that has been the difference. But it's still very much a stalemate with both finishing 1st or 2nd in each race. All this nonsense about cracking under pressure is kind of amusing. Especially considering Hamilton's performance in the last 2 close championship fights (winning 4 races consecutively to end 2016 and winning 6 out of 7 to end 2014). What pressure is there in the third race of the season? I agree that on aggregate across the 3 races that the race pace of the cars are more or less equal. Clearly, Hamilton is very good under pressure, but collectively Mercedes do look under a different sort of very real pressure which will lead to them at least having to re-evaluate how to approach the season going forward. They can't afford to keep being so slow to act, nor to think they have the performance cushion they used to have to piddle about with their drivers. 1st and even 5th is better than 2nd and 3rd. If anything, given the race pace shown by Hamilton, the race suggests that Mercedes will be the team to beat going forward due to their qualifying advantage. There is the suggestion though that in fact it was a track that heavily favoured Mercedes. The next races can't come soon enough.